September 26, 2017 - 8 pm @ IL Kino. Mirlan Abdykalykov (b. 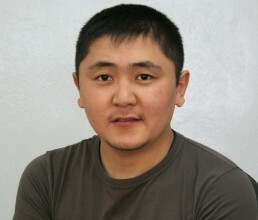 1982) studied journalism at Kyrgyz National University (1999-2004) but he has been active in the film industry since childhood. In 1993 he landed his first lead role in Swing (Altybakan, 1993), directed by Aktan Abdykalykov, today known by the pseudonym Aktan Arym Kubat. Their cooperation continued on further projects: The Adopted Son (Beshkempir, 1998 – screened in the East of the West section at KVIFF 1999) premiered at Sundance and The Chimp (Maimil, 2001) competed in the Un Certain Regard section at Cannes. Since 2004 he has assistant directed for Begym film studio, working in the same position on Abdykalykov’s The Light Thief (Svet-Ake, 2010), which also screened at Cannes. In 2008 he founded Selkinchek productions, which turns out not only commercials and social network videos, but also shorts and documentaries.